A new picture below (NASA credit) showing a mysterious pyramid-like formation were recently released by Dawn mission center, stirring quite a bit of thrill among UFO enthusiasts. Although NASA is always on the pessimistic side when it comes to life beyond the Earth, the pyramid is simply unexplainable, considering all knowledge about the dwarf planet, and its already charted topology. Ceres is not the moon of a big planet, such as Jupiter or Saturn, so tidal heating cannot be responsible for volcano eruptions. This is why more and more scientists agree that the pyramid, rising almost 5000 meters off a very flat region, can only be explained through plate tectonics or, most remotely, through geysers. Even so, the shape is just too odd and much too solitary to be result of a purely random natural event. Until Dawn plunges even deeper towards Ceres’ surface, we can only dare dream of an explanation involving extra-terrestrial life. 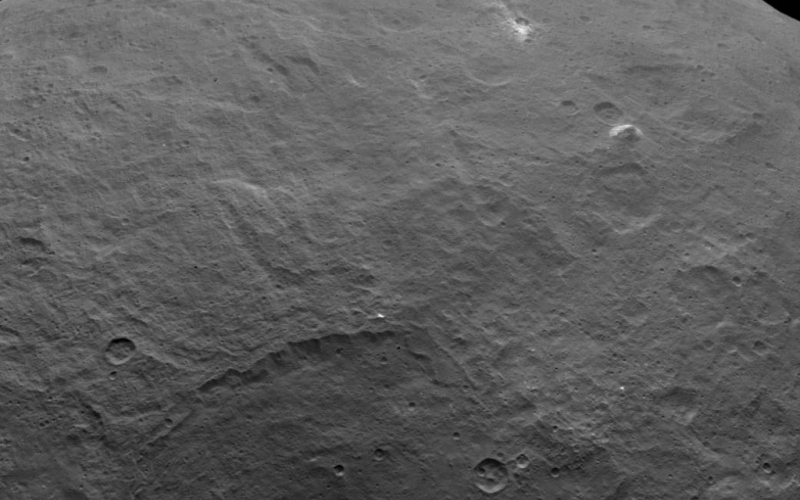 On the 30’th of June, Dawn will descend to 1450 km above Ceres’ surface, capturing new images that will most likely reveal the dwarf planet’s secrets.